An intrusion into the military unit has not been confirmed. 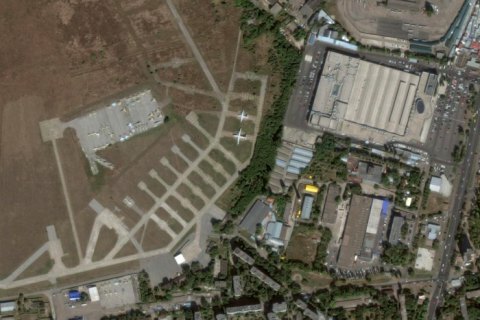 On the morning of 29 October, people wearing face masks entered military unit A3571 in Odesa (Shkilnyy airfield) and took away its property, the press centre head of the Ukrainian Armed Forces' Air Force Command, Roman Yurchylo, told 112 Ukrayina TV during a live phone conversation. "At around 08.40 a.m. today, around 40 people in balaklavas attempted a raider seizure of a part of a military facility owned by the Defence Ministry of Ukraine. Unidentified individuals who introduced themselves as representatives of the [nearby] City Centre shopping mall partially dismantled the fence of military unit A3571 and moved military property away in an unknown direction," he said. According to Yurchylo, the seizure was stopped and the incident was reported to the military prosecutor's office. However, an adviser to the Odesa regional police chief, Ruslan Forostyak, later denied Yurchylo's statement on the air of 112 Ukrayina TV. "We received a report about the mentioned events, an operative investigative team and police representatives went to the site. They learned that, first, construction works mentioned in the report are being held on the area adjacent to the military unit, the developer has all requisite documents and permits. We checked surveillance cameras and witnesses' statements and learned that these were not hired heavies (titushkas) but regular builders," Forostyak said. He said there is a dispute over land ownership between the military and business. There was no intrusion into the military unit. Decommissioned aircraft and helicopters are stored at the Shkilnyy airfield.